JON Baxter sparked a massive search and online frenzy when he vanished off the face of the planet last month. 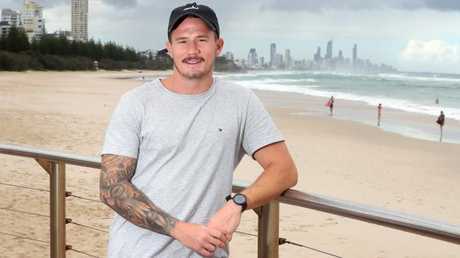 He told friends he was heading to Fingal Heads for a haircut on Tuesday, January 9. It was the last loved ones saw of him for two days before he re-emerged from Lismore Hospital. The family's frantic search for the 26-year-old was seen and read by tens of thousands of people online. 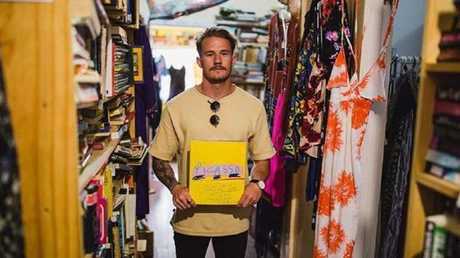 Speaking for the first time, Mr Baxter, the co-director of creative studio Jáen Collective, tells the Gold Coast Bulletin he never went to get his haircut. This is the photo friends, family and media frantically shared around the internet, hoping someone had seen Jon. 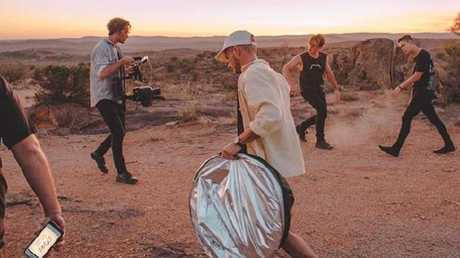 Instead, he drove to remote northern New South Wales to scout "vast, country locations" for coming music videos his company was shooting, where he wrote off his car. 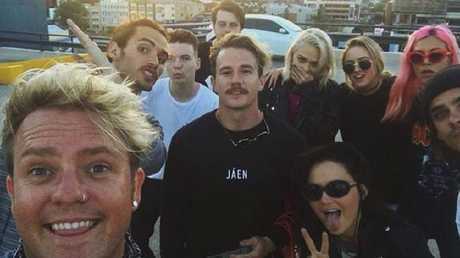 "I had two music video shoots I had to get done in the next four days for Jáen and I hadn't secured any locations, so I really wanted to get that done," he said. "So I got out there and was going down some pretty hectic roads. I just drove a little black Audi that shouldn't really be on roads like that, dirt roads and loose gravel, but that's how you find the good locations. "I was going around a corner and lost control. "I didn't roll or anything but I wrote my car off and I had no phone reception so I needed to find a house." The crash occurred at Tenterfield, about 300km drive southwest from the Gold Coast. After crashing his car, Mr Baxter found himself lost, with no reception, no shoes, no food or water and a quickly setting sun. "I walked in the wrong direction to find a house," he said. "I didn't take any shoes either (that morning) because I thought it'd just be a quick little trek. "I was thirsty. I'd been driving all day, looking at locations and then walking and at the time it was like 39C. "I went into the bush to find water and found a creek, but the water turned out to be stagnant, so that started affecting me as well. "I was doing my best to tap into my Bear Grylls skills but that didn't really work. "I'm lost, it's now dark. I've drunk stagnant water and my phone's about to go flat completely, so I just posted up at a tree and waited for the sun to come up so I could find my way out." When the sun rose on Wednesday, January 10, Mr Baxter continued his search for help. "When the sun came up I found a fence line and a car track so I thought 'OK, I'm good again. Let's go find people to get me out of here'. "There was a bunch of cattle around so I knew there must be a farmer somewhere, so I just kept on walking." Severely dehydrated after walking for hours, Mr Baxter spotted a dam among the paddock and desperate again, went to the edge for water. "I'd been walking all morning in the hot sun. I'm so thirsty. "And that's when I get bitten by the snake. "One fang went into the side of my hand and I had to shake it off before it scrambled into the dam. 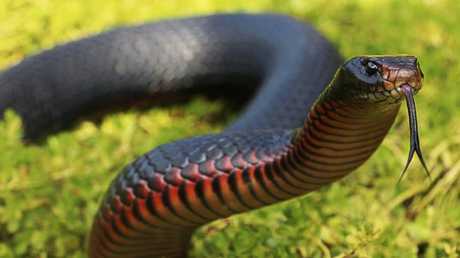 "I saw it was a red belly black snake. When it's on your hand you can see it pretty good. "And I'm like 'OK, I've now been bitten by a snake'." Raised on a farm at Mt Tamborine, Mr Baxter knew what to do with a snake bite, but said the effects of the venom were instant. "I knew to stay calm and wrap it up to not let the poison go through my body, but I felt it (the venom) straight away go through my hands. "It kinda just felt hot. And my hands and feet just instantly felt bigger and I had tight skin. "It only got me on the pinky so I took the drawstring from my pants and wrapped my pinky up. "It (effects of the venom) was coming in waves but I just told myself to stay calm. "I sat down for a bit and had a look in which direction I was going to go for, taking deep breaths. "I knew not to run or get my heart rate up because that'd cause the venom to circulate around my body quicker." Miraculously, he devised a rescue plan that required minimal movement. "I walked to the top of the hill and spooked all the cattle to get someone's attention. "I spotted a farmer who was doing excavating. I see him come through the field and he called for help. "Another two farmers came out and they took me to an airlifting spot and I got flown out to Lismore Hospital. "From there I just focused on getting better. Getting the anti-venom and some antibiotics, and they put me on a drip for my dehydration. "It wasn't until Thursday afternoon I started letting everyone know where I was. 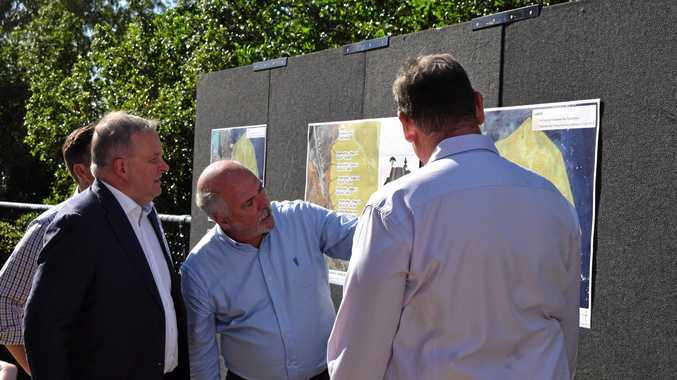 "That's when my business partner Nick put the post up on our Jáen Instagram page letting everyone know where I was." 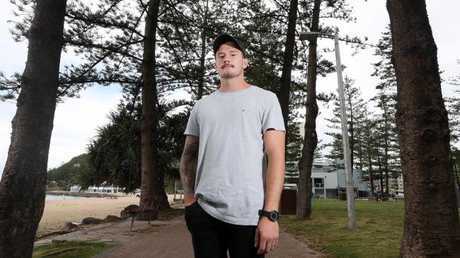 Unbeknown to him, back on the Gold Coast, a missing persons frenzy was in full force. During his journey, Mr Baxter had lost his phone, so hospital staff could not contact his loved ones. was deeply touched by how many people had shown their love and concern. "I had no idea how much time had passed so I had no idea what a big deal it was," he said. "It was super humbling to see how many people cared. "There were so many people who I didn't know cared or knew about me or Jáen who were sending me messages. "So I made sure I wrote back to every single one and said thanks for reaching out." As for the cliche about near death experiences and new leases on life, Mr Baxter said it was "definitely" true. He was even among the group of good samaritans who helped paraplegic Carl Reimer reach the peak of Mount Warning in his wheelchair late January. "I think it's definitely an eye opener as well, just to check and bring things back to balance. "It's also made me realise how amazing life is. Like I'm running a videography company doing what I love with my best mates, but I was pushing myself too hard. "I was really unhealthy, sleep patterns didn't exist and I was just working all the time. "It's super hard for me to go to sleep when I know there's work to be done. "It put things into perspective, make sure you get rest, don't push yourself too hard. "Let myself have some 'Jon time'."